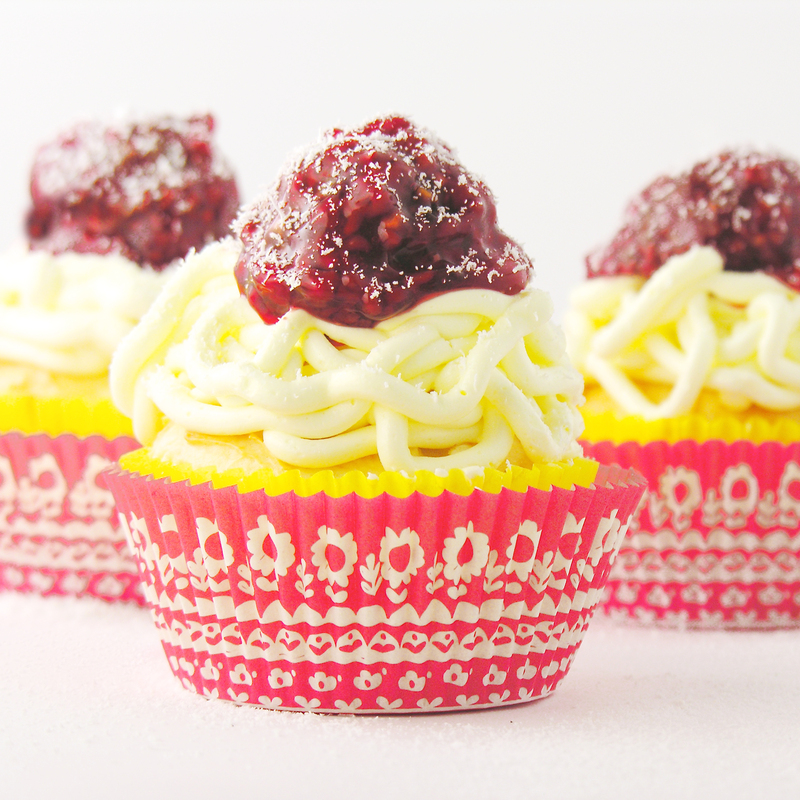 Nothing says “April Fools’ Day!” like these fun spaghetti cupcakes with a yummy chocolate “meatball” on top! Direct quote from one of the kids I offered this cupcake to. I love April Fools’ Day! When I was little, my mom was always trying to fool us with food. I remember opening up my lunch at school one year and seeing green milk and a sandwich with no meat and an apple with little candy worms coming out of it. I’m sure she was laughing every year when she packed lunch on April 1. So, I try to be original here on Easybaked. My favorite moments are when I have an idea, I google it, and NOTHING comes up. Believe it or not, that happened to me with Oreo Pops. Nobody had done them when I created my 1st batch! THIS recipe is not an Easybaked original. It is one I saw all over the internet, and simply had to make for myself! Melt white chocolate chips in the microwave in 30 second increments, stirring in between until melted and smooth. Spoon this into a small paper or disposable plastic cup and place in the freezer for later. Make cake mix according to box, and divide into 24 cupcake liners in cupcake tins. Bake according to package and cool. 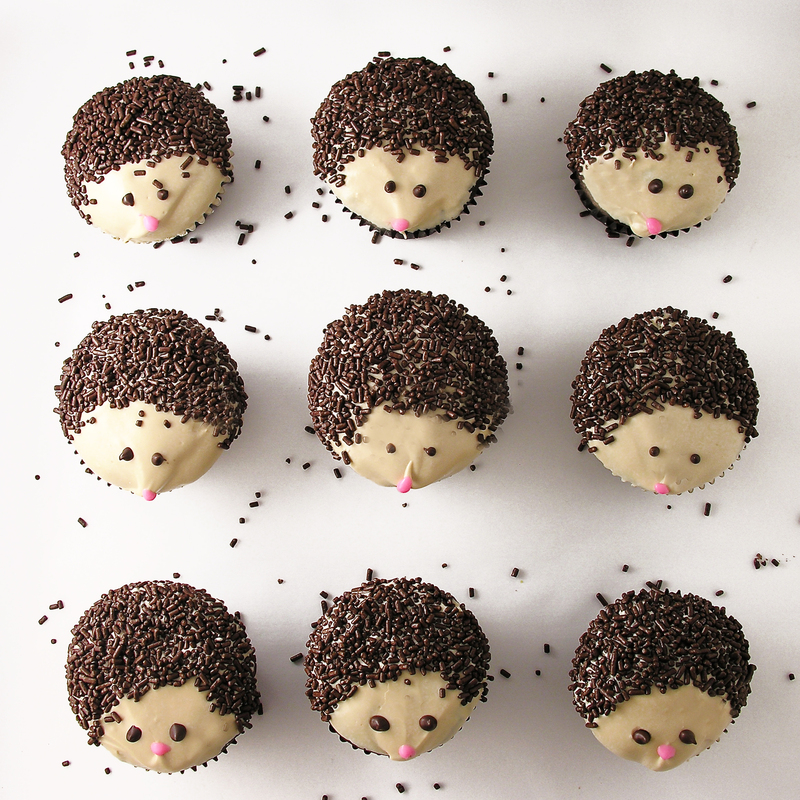 Place them into a couple of cake pans so you can move them easily into the fridge. Place butters, vanilla, and powdered sugar into a large mixing bowl and beat on high until very light and fluffy (3-4 minutes). Add a TINY bit of yellow food coloring. Your frosting will already be a touch yellow from your butter, but you want it to be the pale yellow of spaghetti noodles. Place frosting into a large zip-top bag and seal. 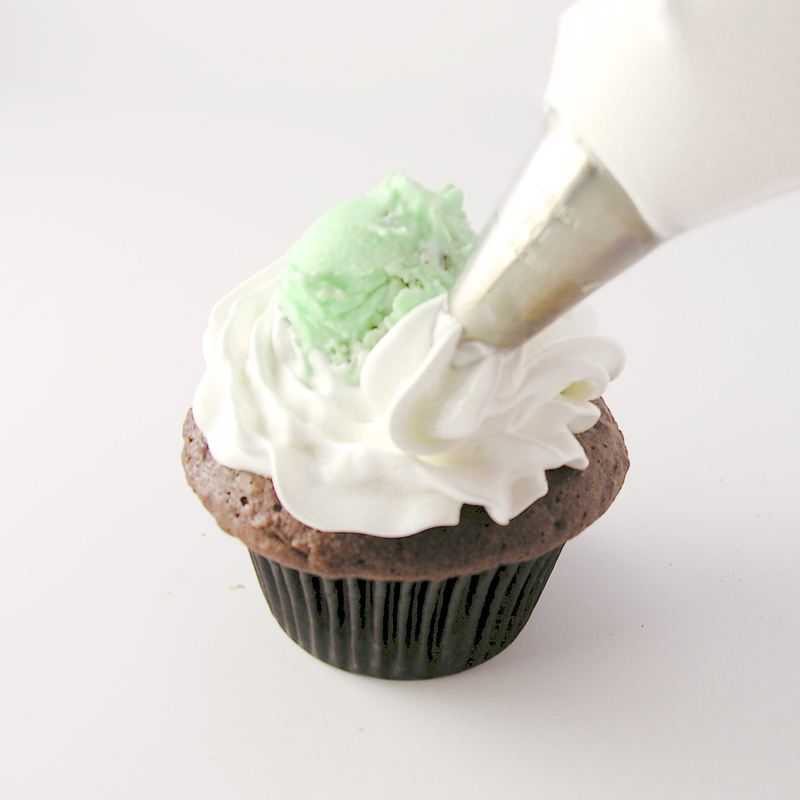 Clip a corner, or if you have one, add a round decorating tip to a corner before adding frosting to the bag. You can experiment with the size. I liked nice fat noodles better than thinner ones. They were more defined. Pipe random swirls of noodles on the tops of each cupcake. Be careful to not touch the tip to anything or they will smudge and look like frosting rather than noodles! 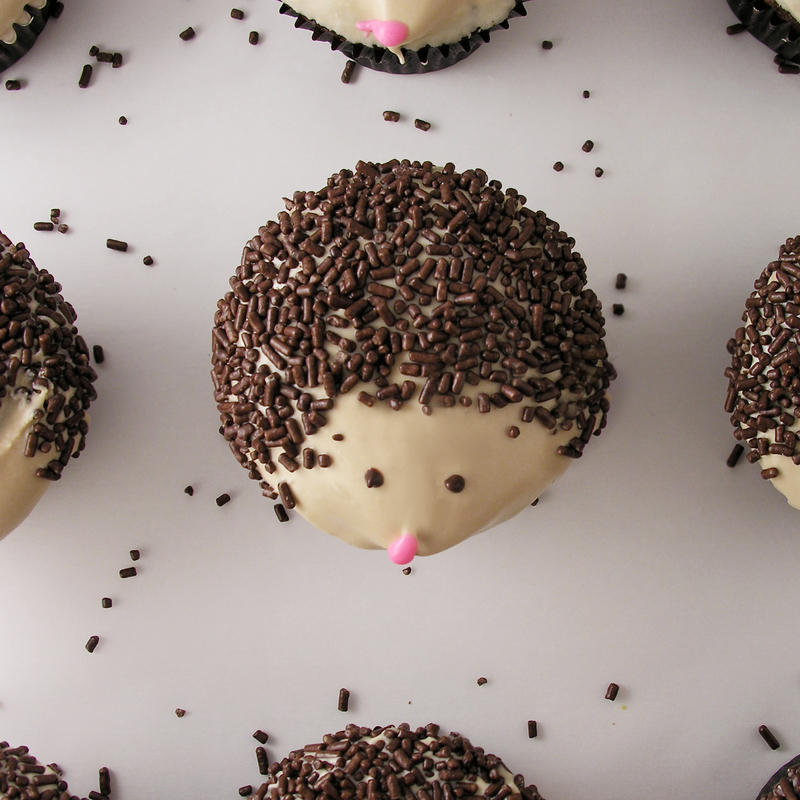 Place cupcakes into the refrigerator for 15-30 minutes. You want that buttercream to harden up before you place anything on top. Open can of pie filling, and unwrap chocolates. 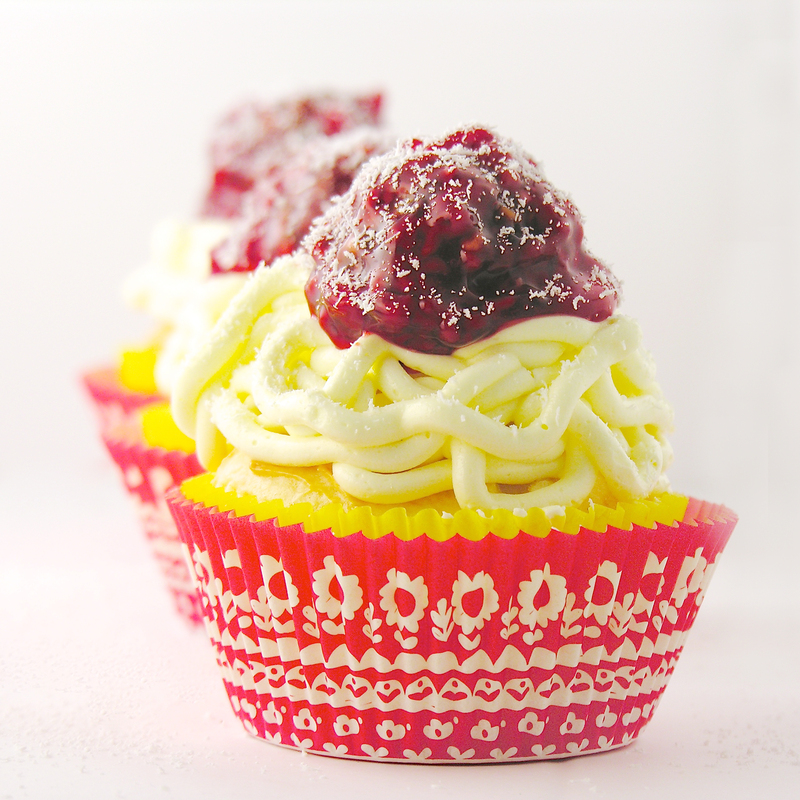 Once all cupcakes have a “meatball”, pull the cup of white chocolate out of the freezer. 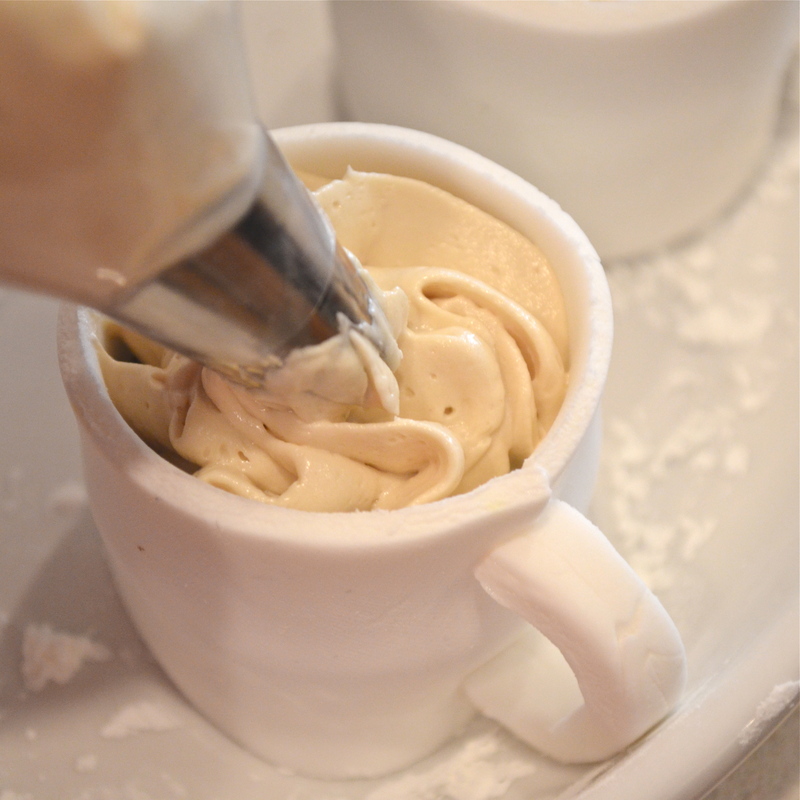 Tear away the paper cup- leaving a little circle of white chocolate. Posted in Cupcakes and tagged April Fools dessert, April Fools' cupcakes, chocolate meatballs, cloudy with a chance of meatballs party, cupcake, cupcakes, cupcakes for kids, Ferrero Rocher recipe, fun kids recipe, funny cupcakes, funny kids recipe, italy dessert, italy party, kid-friendly recipe, kids party cupcakes, lady and the tramp party, make spaghetti with frosting, spaghetti and meatball cupcakes, spaghetti cupcakes, unique cupcakes, unique desserts. Bookmark the permalink. 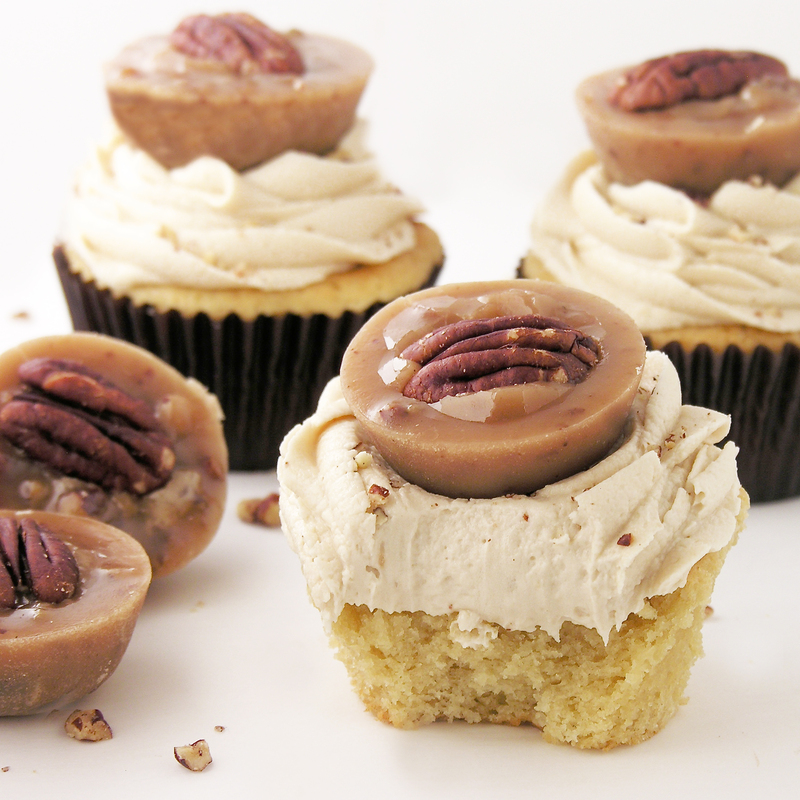 If you love pralines, you will love these pecan praline cupcakes with delicious homemade pralines on top! 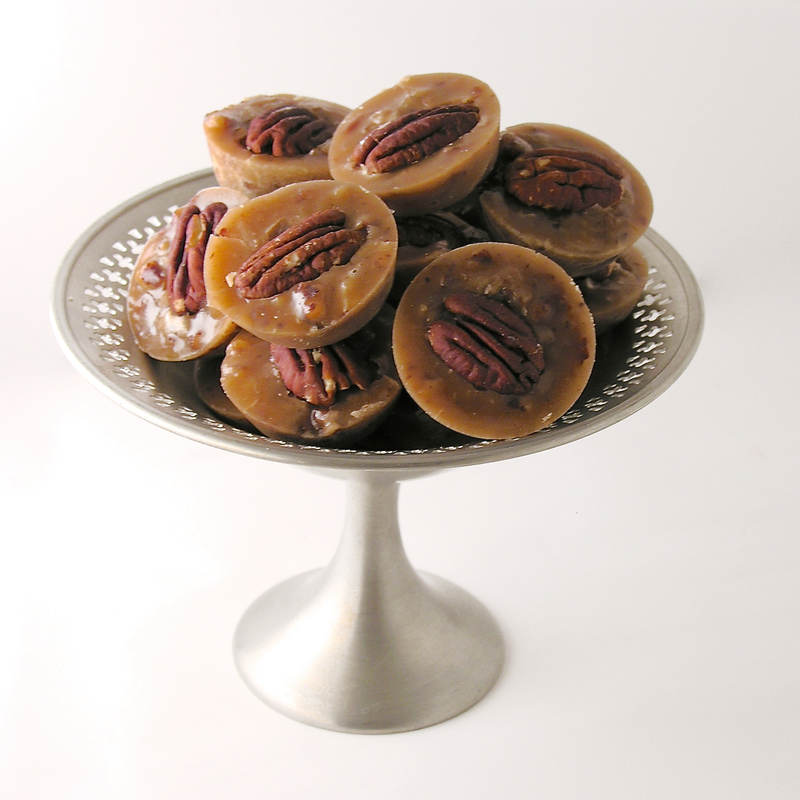 I’m a huge fan of pecan pralines. Our family has often traveled to the southeast part of the US and there’s just nothing better than a still-warm praline in Charleston or Savannah… YUM! I’ve always wanted to try making homemade pralines, but I’ve never had a good recipe. 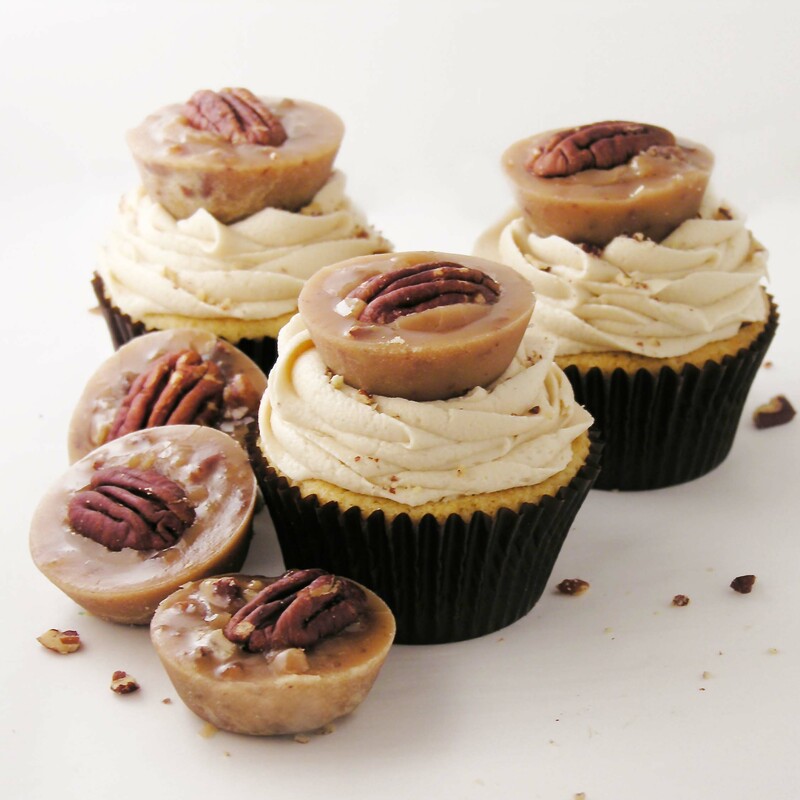 Last month, we visited family friends, Dave and MaryAnne, and Dave told us he has the BEST pecan praline recipe. He whipped some up for us and oh my…. 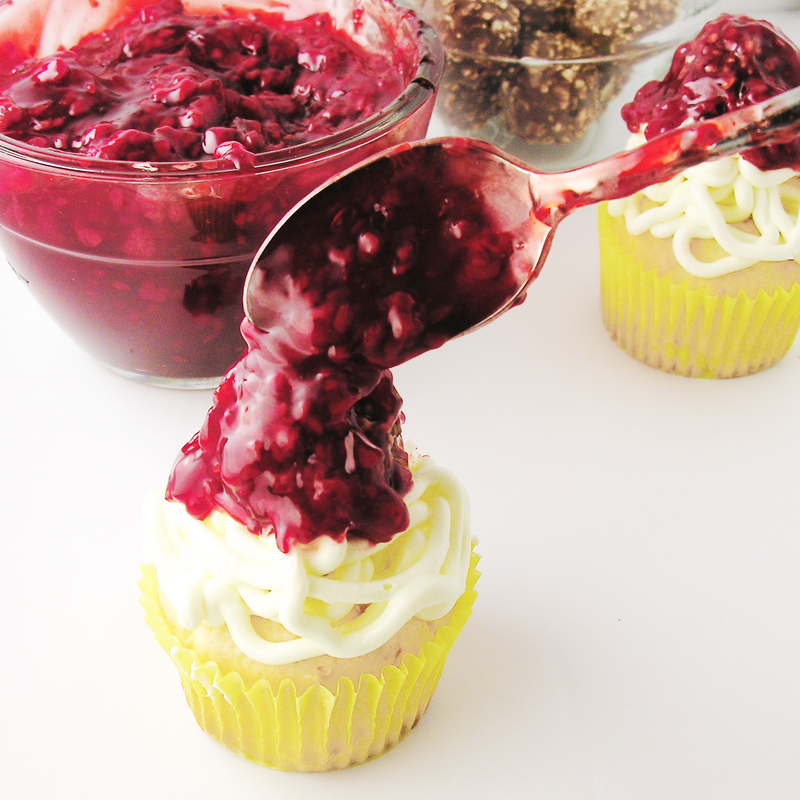 He shared his recipe and I had the idea to carry some of those flavors over into cupcakes. 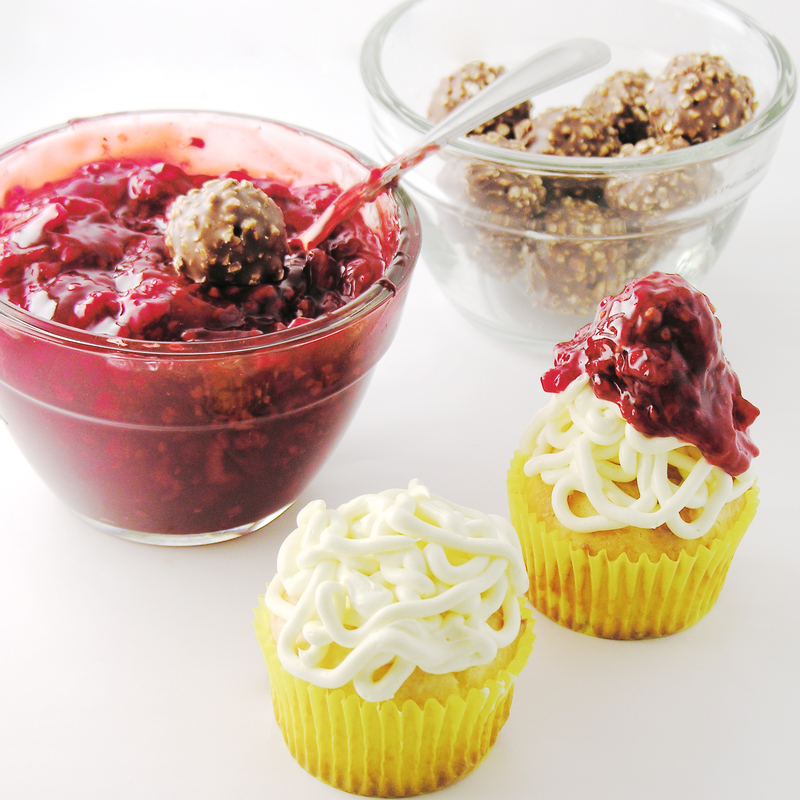 Really, these two desserts stand alone, but are especially fun together! 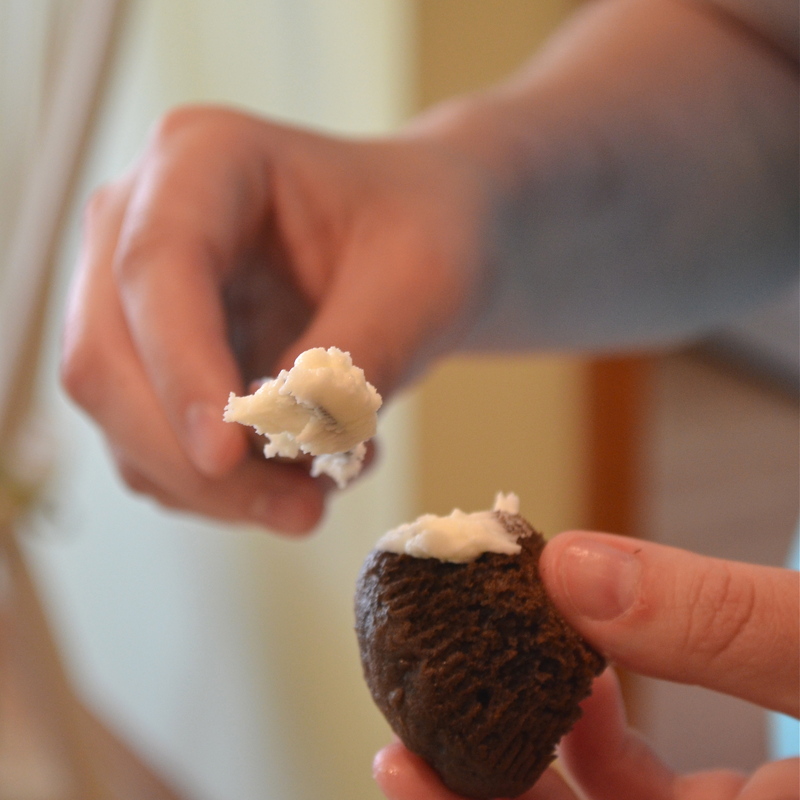 Use oil or butter to coat a mini muffin tin well. Place all ingredients (except the whole pecans) into a large saucepan and heat over stove, stirring occasionally, until it reaches 234F degrees. Remove from heat and stir for 5-8 minutes until the candy loses it’s glossy look and gets more cloudy and granular. Spoon (carefully!!!) into well- greased muffin tin. 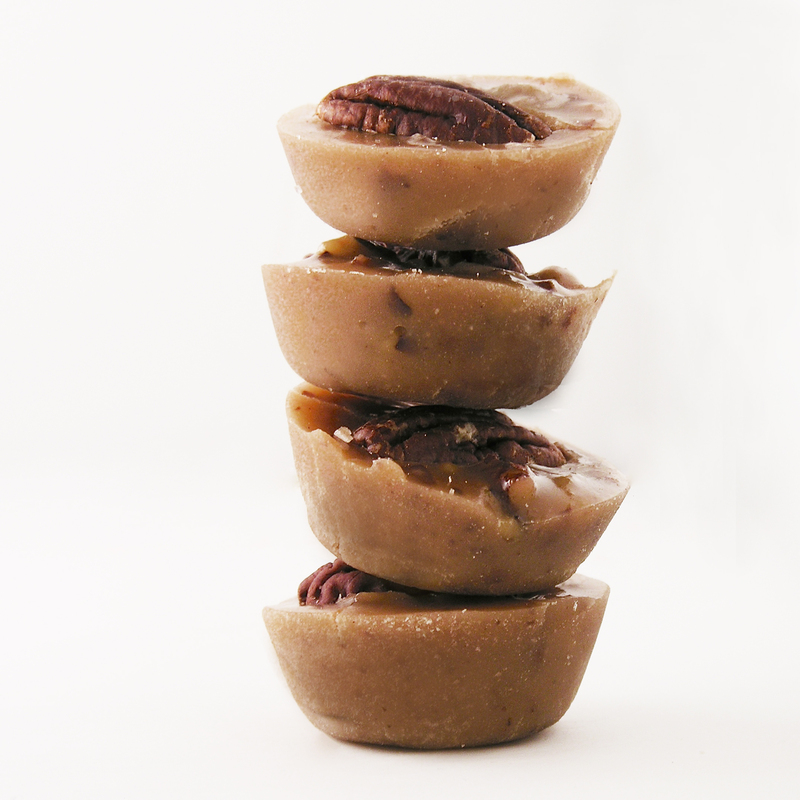 Press a pecan half into the top of each praline and allow to cool. When cooled, tip onto clean surface and ENJOY! 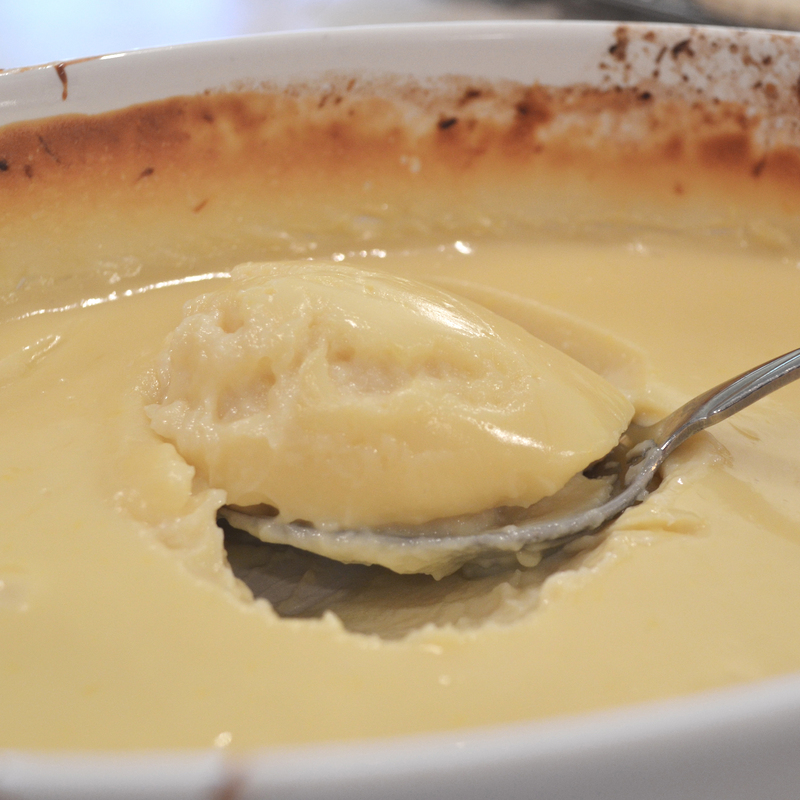 In a large bowl, use a mixer to cream together the sugar and butter for about 3 minutes until light and fluffy. Add eggs once at a time until incorporated and then mix in vanilla and maple flavoring. In a different large bowl mix together the dry ingredients: flour, baking powder, and salt. Add flour mixture to the sugar and butter, alternating with the cream. Fill cupcake liners about 2/3 full and bake for 15-18 min. Be careful to not over-bake. Cool in pan for a few minutes before removing to finish cooling on the counter. In a small sauce pan, heat brown sugar, cream and 2 tablespoons of butter on medium heat, stirring often, until sugar dissolves. Remove from heat and cool completely. In a large bowl, beat together the cooled brown sugar mixture with remaining butter until smooth. Add powdered sugar and beat on high until light and fluffy. 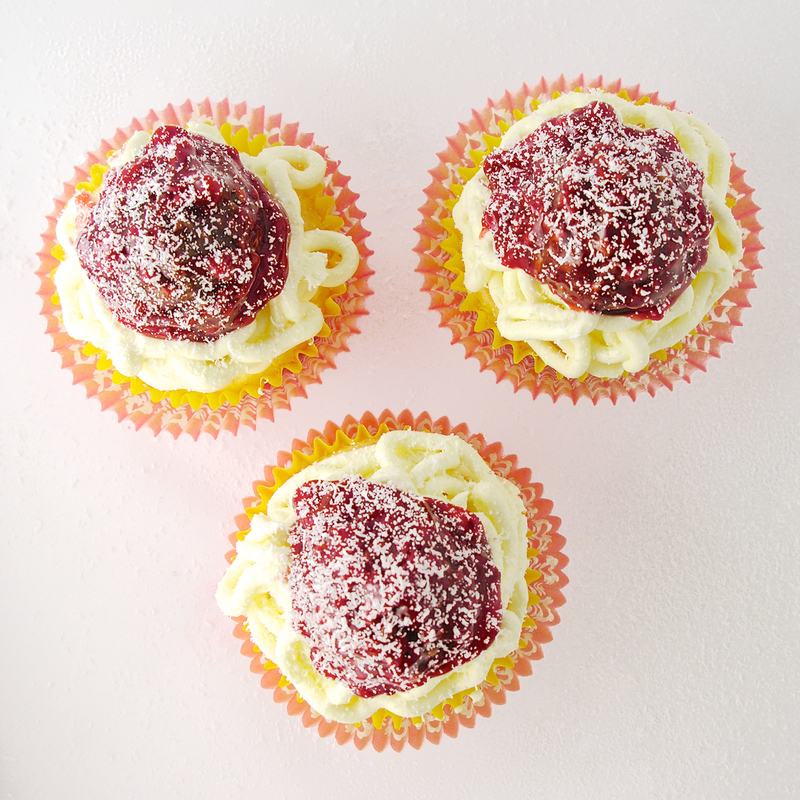 Place in a zip-top bag fitted with a decorator’s tip, and pipe frosting onto cooled cupcakes. Top with a praline- or even a pecan half instead. Posted in Cupcakes and tagged best, brown sugar, brownsugar frosting, cupcakes, dessert, fun cupcakes, pecan cupcakes, pecan praline cupcakes, pecan pralines, pecans, praline frosting, pralines, recipe, sweet, unique cupcakes. Bookmark the permalink. 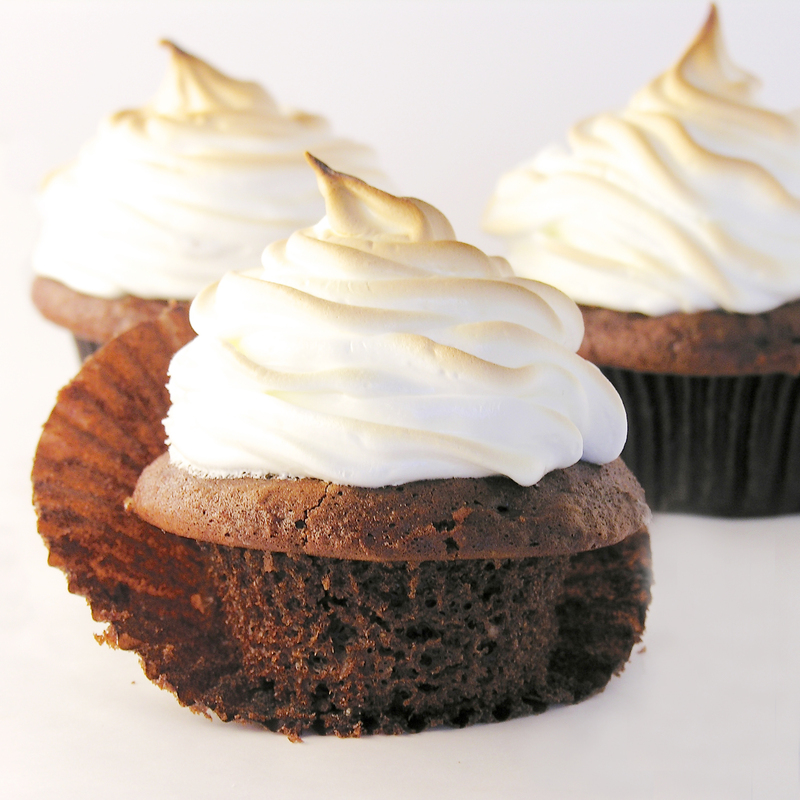 Rich chocolate cupcakes topped with a scoop of ice cream and a cloud of toasted marshmallow meringue. Best. Dessert. Ever!!!!! Every year for Christmas our family goes out to an incredible restaurant near Marshall, MI called Win Schulers. They have the most amazing prime rib…oh my. Anyway, within a week of Christmas it is my birthday, my mom’s birthday and my sister-in-law’s birthday. 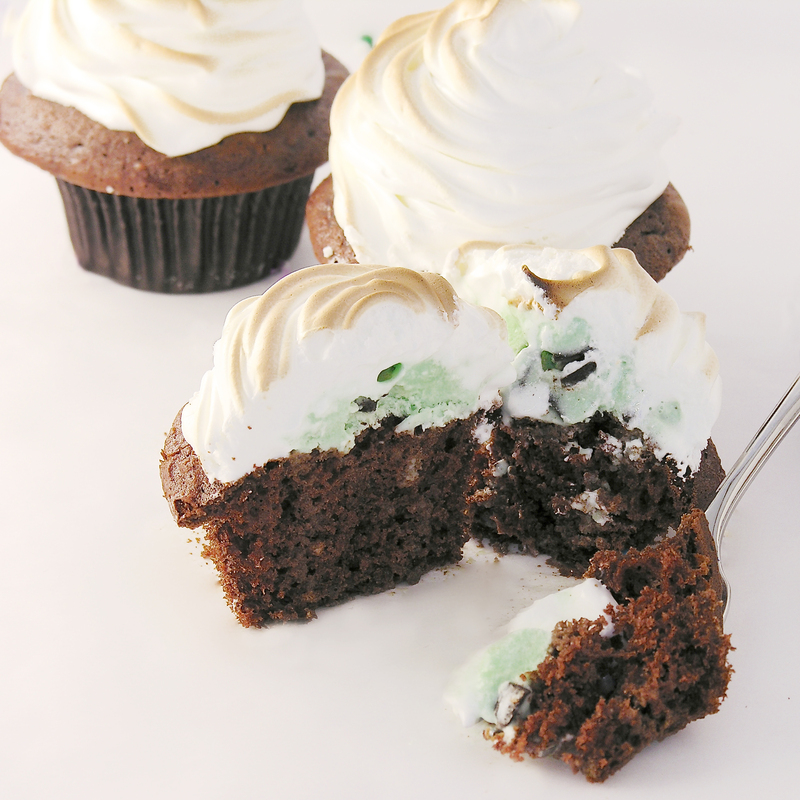 Schuler’s gives you a Baked Alaska for your birthday….so it’s a feast of Baked Alaska and it is SO good. 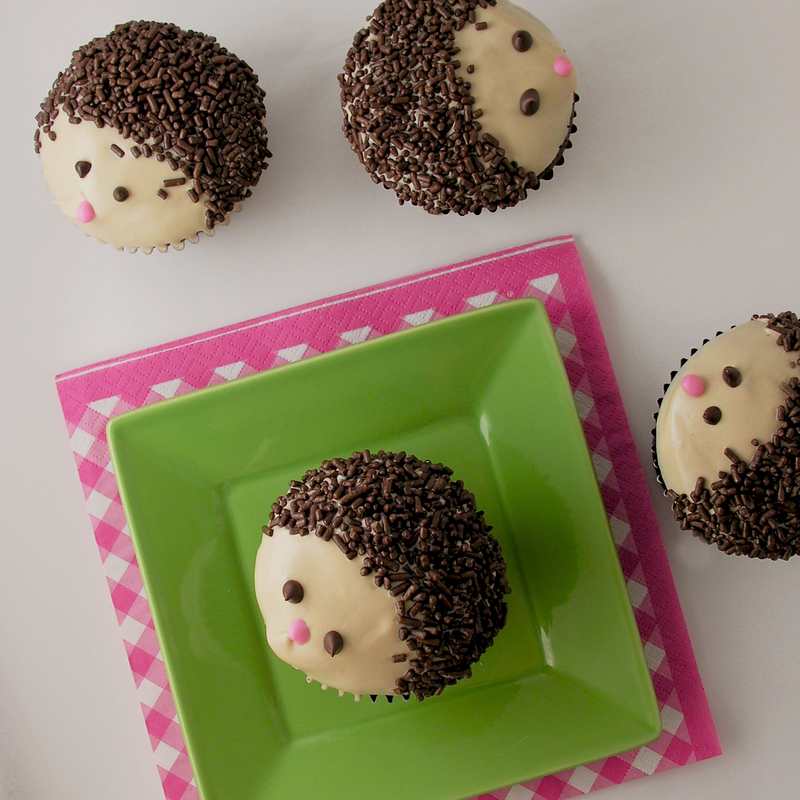 About 2 weeks ago I was craving it and suddenly was struck by the idea of making it in cupcake form. A.M.A.Z.I.N.G. Just go and make these. Use your favorite ice cream. You will love them…! 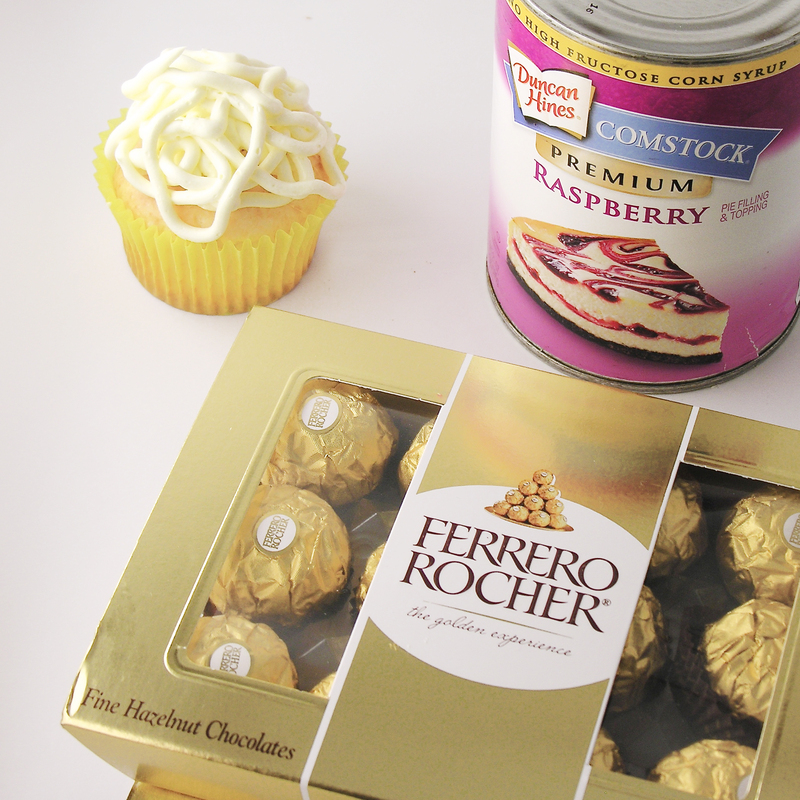 Make cake mix according to box directions and divide equally into 24 cupcake liners in cupcake tins. Whisk ingredients together for about 3-4 minutes. Sugar will be dissolved and egg whites should be heated to 145F degrees. Spoon all that wonderful marshmallow yumminess into a bag fitted with a decorating tip. 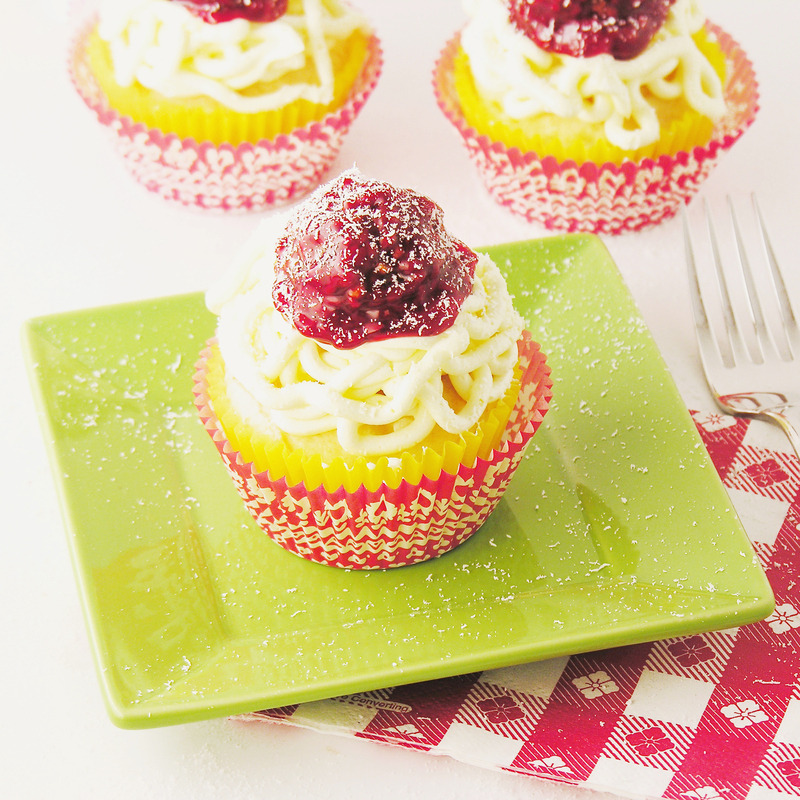 Assemble one cupcake at a time, and then pop it into the freezer immediately. 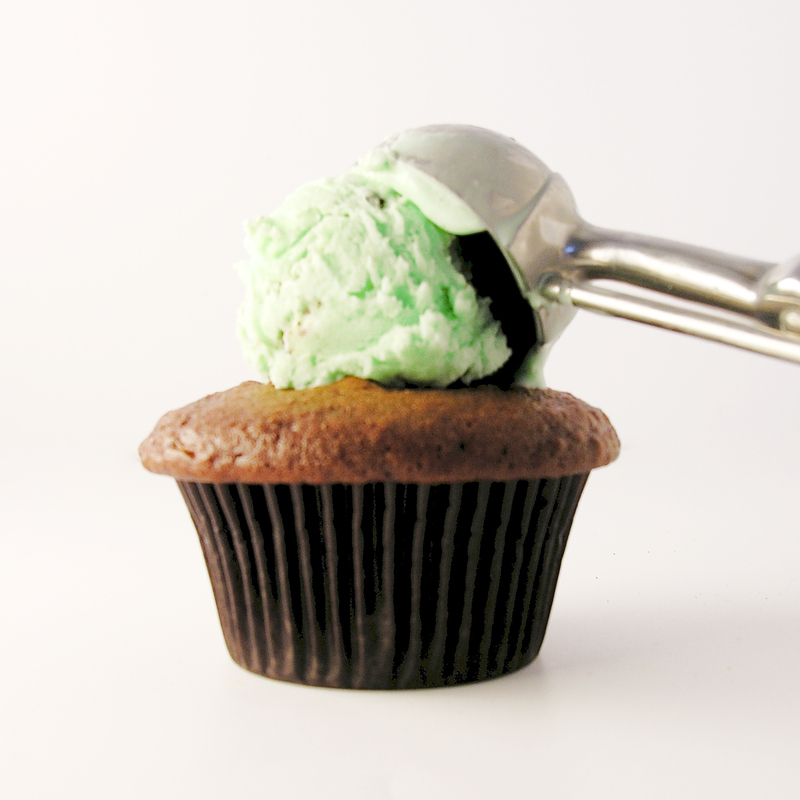 Take a cupcake, use a small cookie scoop or melon baller and place a scoop of ice cream in the center of the cupcake. Pipe meringue all around it, being careful to seal up all the ice cream at the bottom and them working your way up to a swirled top! to toast the marshmallow just before serving. These are best served within a couple of hours of making them. Since they are a fork-eating-cupcake anyway, I see no harm in adding hot fudge…. Posted in Cupcakes, Frozen desserts and tagged baked alaska, best, chocolate, creative cupcakes, cupcakes, dessert, fun cupcakes, fun dessert, fun recipe, ice cream, ice cream cupcakes, kids, kitchen torch, marshmallow, marshmallow meringue, meringue, recipe, unique cupcakes. Bookmark the permalink. 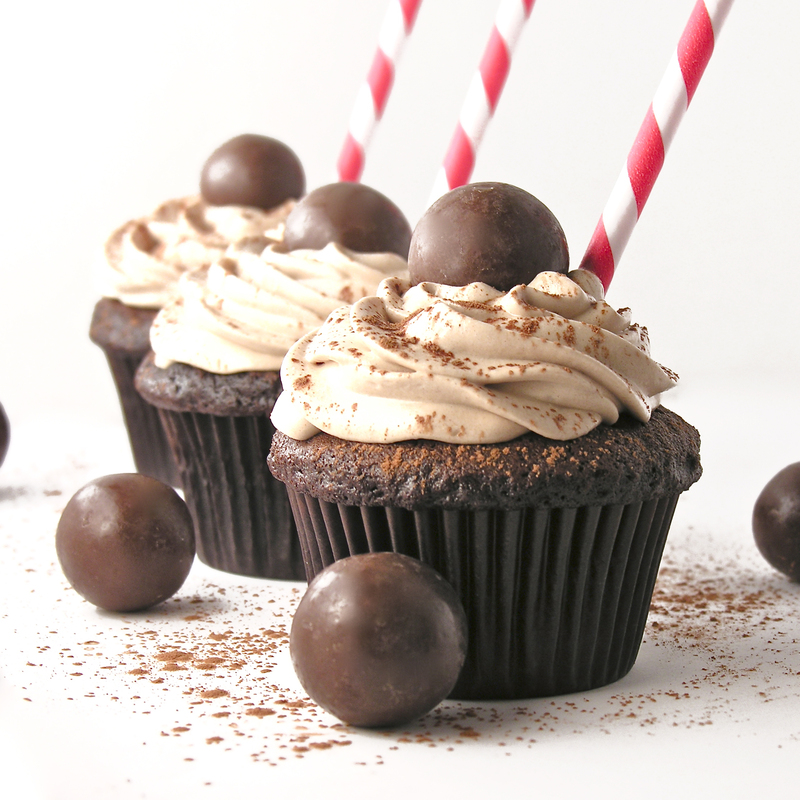 Dark chocolate cupcakes topped with the creamiest malt frosting ever. Like a malted milkshake minus the cup! I have an addiction to chocolate malts. Not chocolate shakes, just malts. 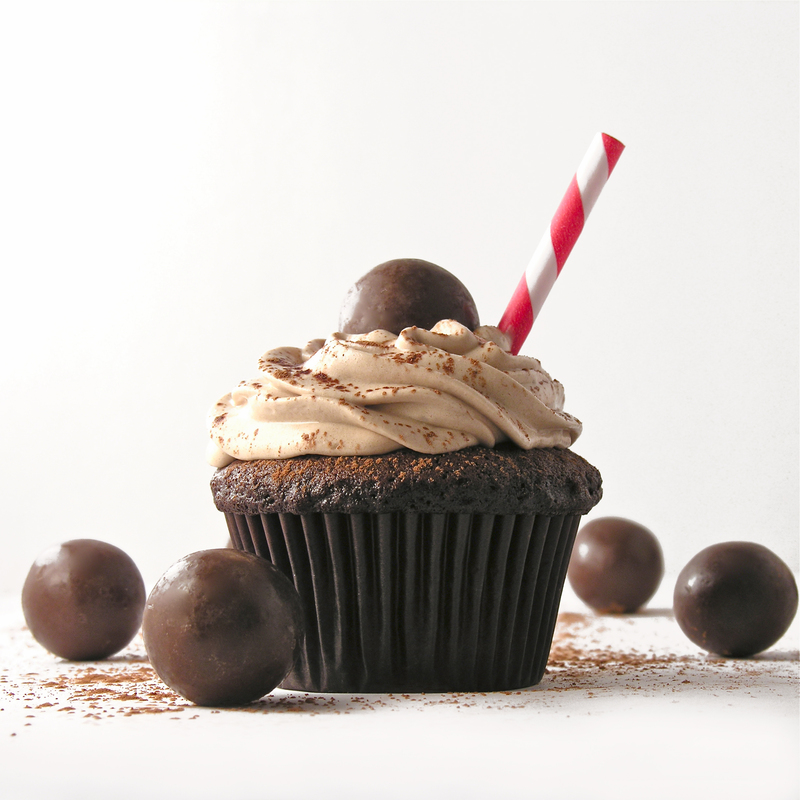 The creamy, chocolatey kind that you drink through a striped straw at the pool. My mom makes the best chocolate malts ever. They are really simple to make, but there’s just something about her leaning out of the patio door and asking, “Anyone want a malt?” that makes me smile. It’s one of our summer traditions. I wanted to make a frosting that tastes like a malt. It took me a couple of tries, but I finally hit the mark. It’s wonderfully creamy and smooth. It is also a very soft whipped icing that must be kept refrigerated because it has milk in it, and because it will not keep a pretty piped finish if it gets warm. Believe me, the flavor and texture are worth it! 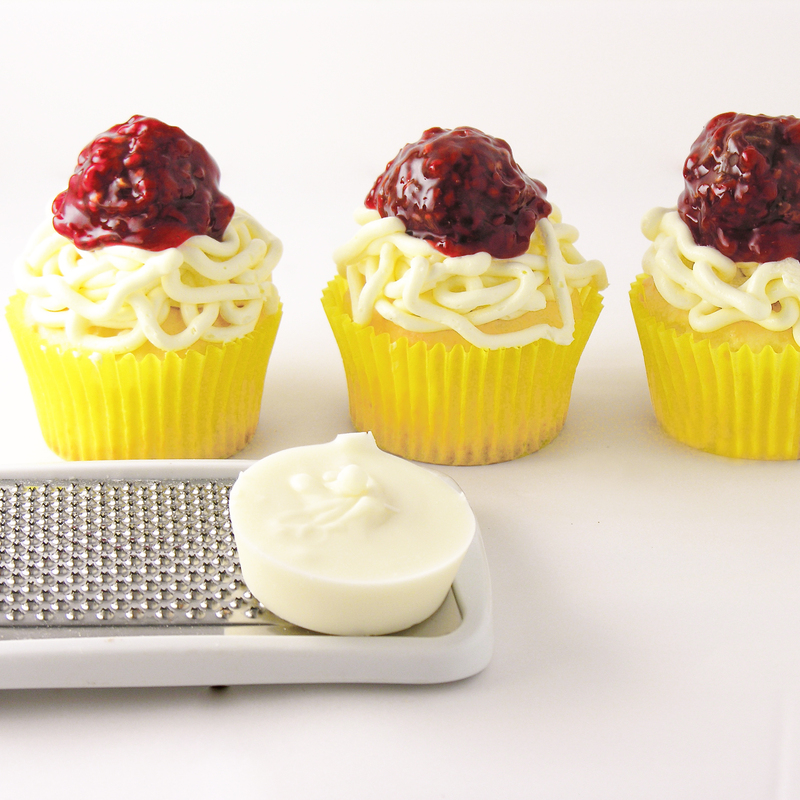 Make cake mix according to box and bake in 24 cupcake liners placed in muffin tins. 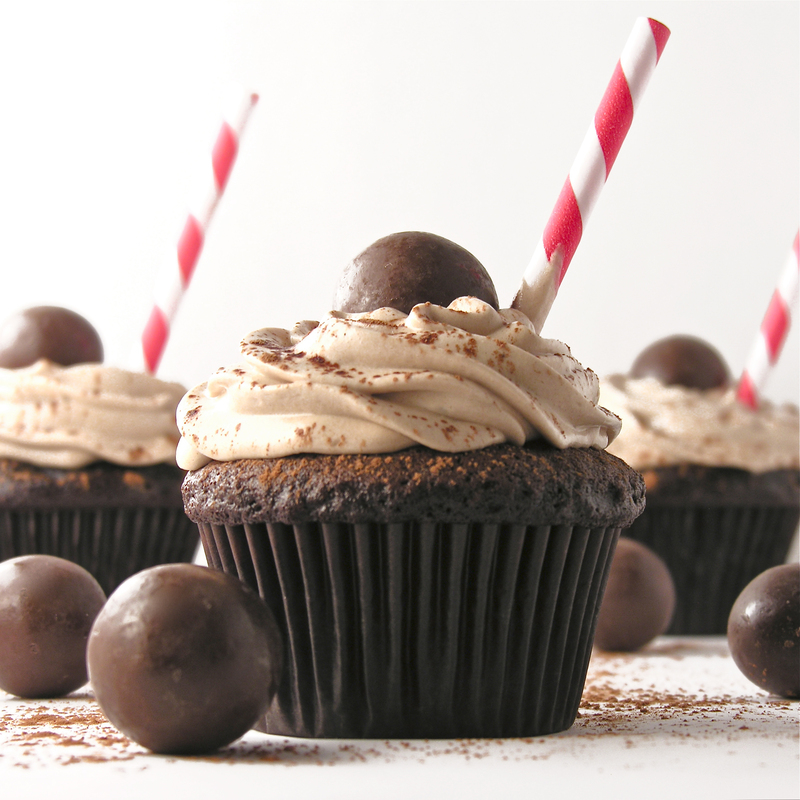 Put Dream Whip, milk, cocoa powder, malt powder and powdered sugar into a mixing bowl and blend together. 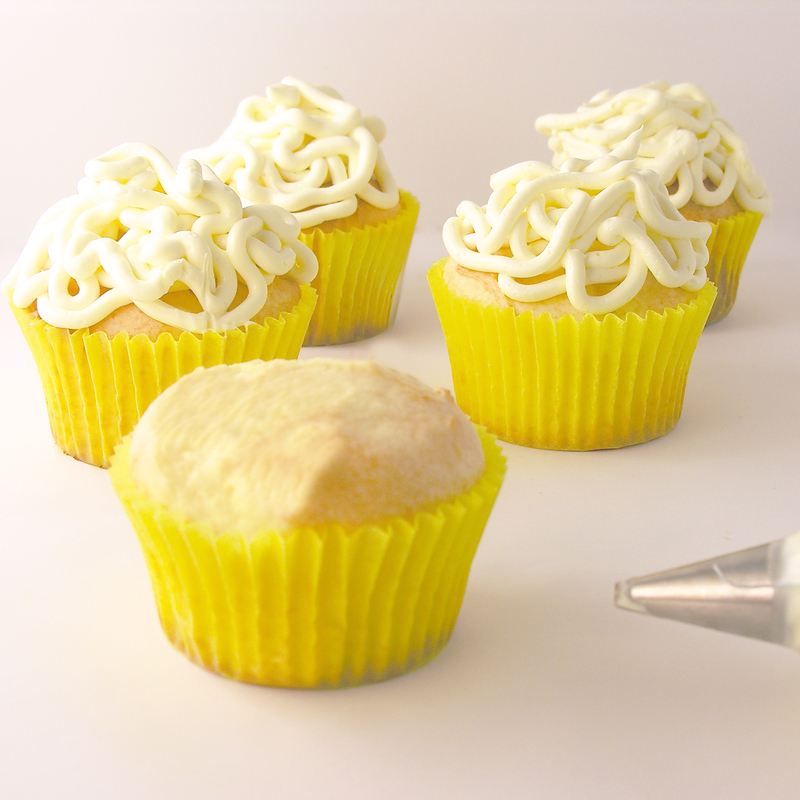 Spoon frosting into a zip-top bag fitted with a decorating tip and pipe frosting on cupcakes. 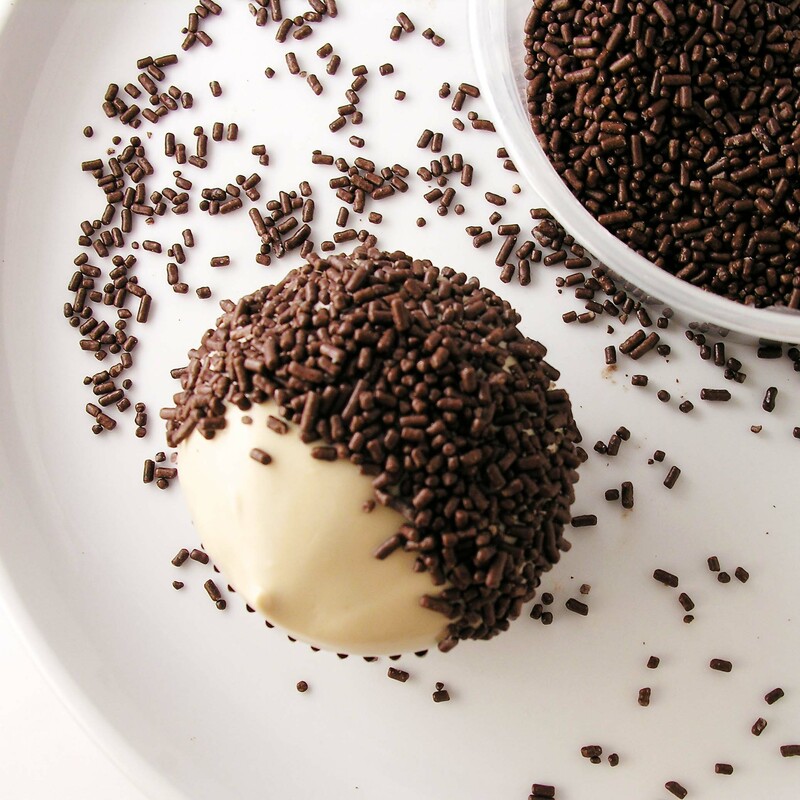 Refrigerate until serving and just before serving add a malted milk ball and sprinkle with cocoa powder if desired for garnish. Posted in Beverages, Cupcakes and tagged baking, chocolate, chocolate cake mix, cocoa powder, cupcake, cupcake liners, dessert, dream whip, fun cupcakes, malt, malt balls, malted milk, malted milk balls, milkshake, muffin tins, recipe, summer dessert, unique cupcakes, whipped frosting. Bookmark the permalink. 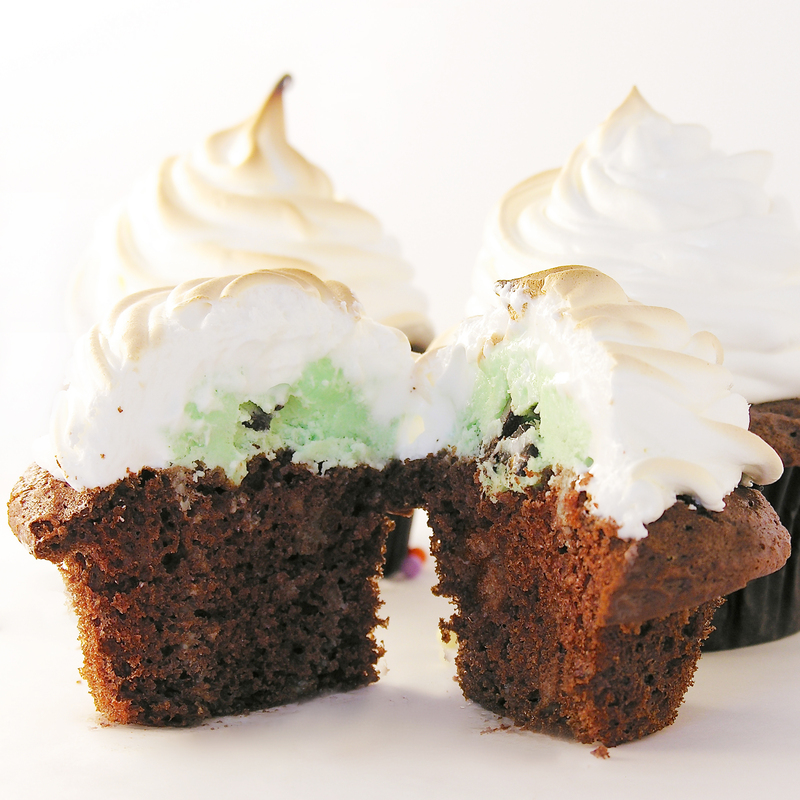 Rich chocolate cupcakes and mocha buttercream nestled in an edible marshmallow mug…how much fun is that?? 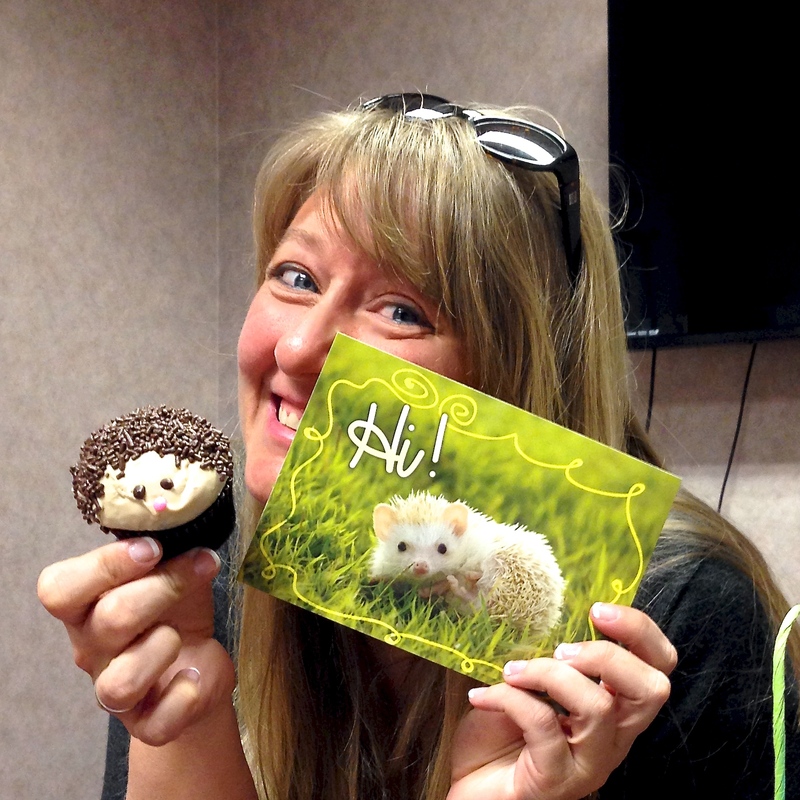 The past two posts have been full of my adventures with my friend Megan from Happily Ever After Cakes. We made chocolate cut-out cookie pops decorated with royal icing and fondant-covered cupcakes decorated with fun ladybugs and caterpillars. This is the third and final project from that weekend and I just love how it turned out! 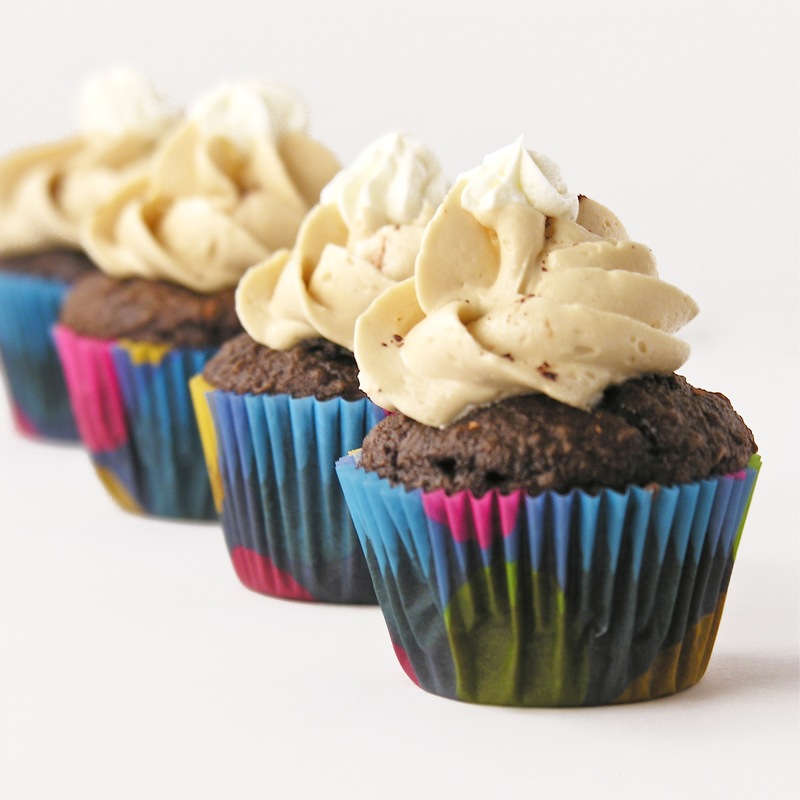 This project starts with easy mini mocha cupcakes with mocha buttercream frosting. You can stop there and they are just wonderfully yummy –even without the mug! The mug uses my new-found love of marshmallow fondant to add a little “wow” factor to the cupcakes. 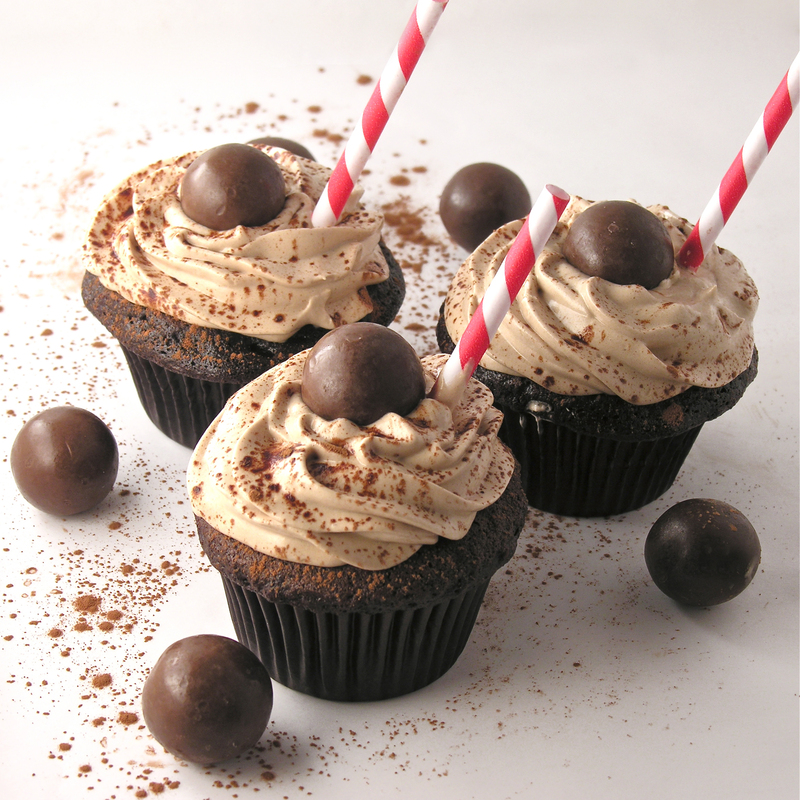 Make cake according to box, but add 2 Tablespoons of coffee granules to the water required by cake mix first. Allow granules to dissolve and then add to cake mix with eggs and oil according to box. 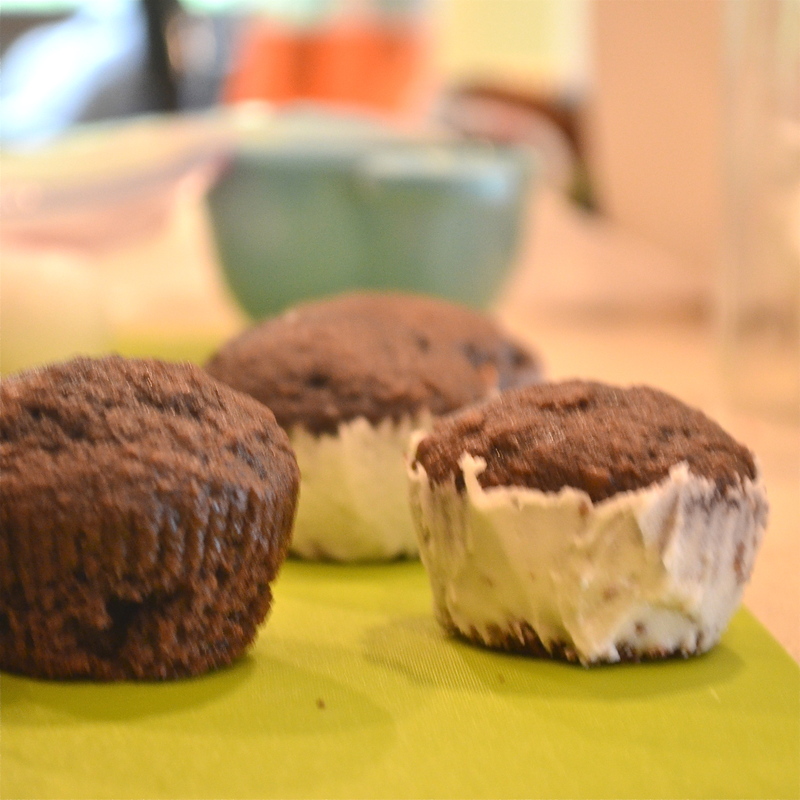 Place mini cupcake liners into mini cupcake pan and spoon batter into liners. Bake for about 12 minutes until centers are firm. 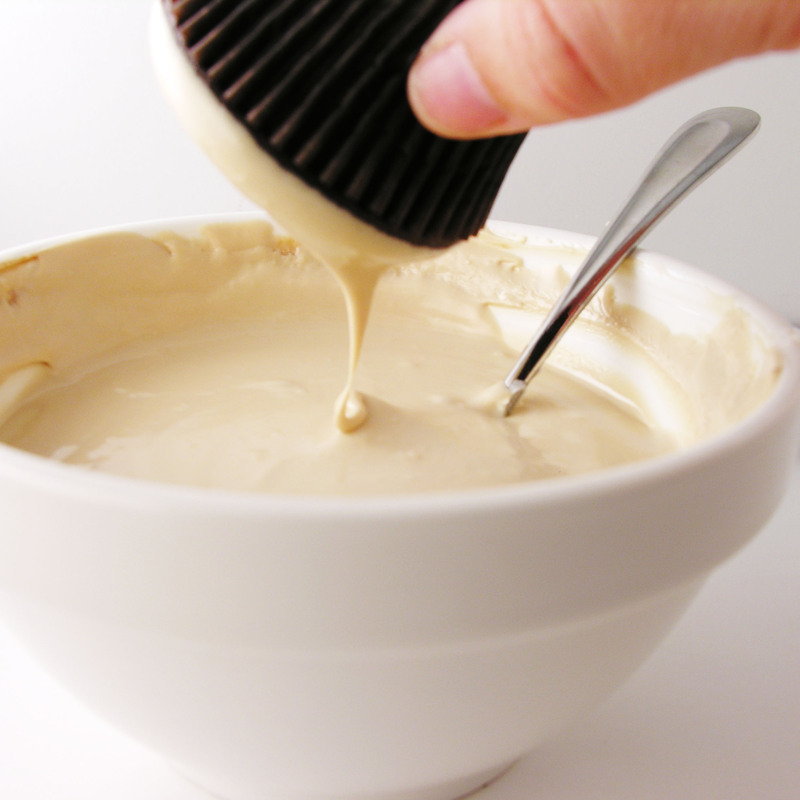 Make buttercream by placing vanilla and remaining 1 Tablespoon of instant coffee into a small bowl to dissolve. Add butters and powdered sugar to a large bowl and beat on high until light and fluffy. 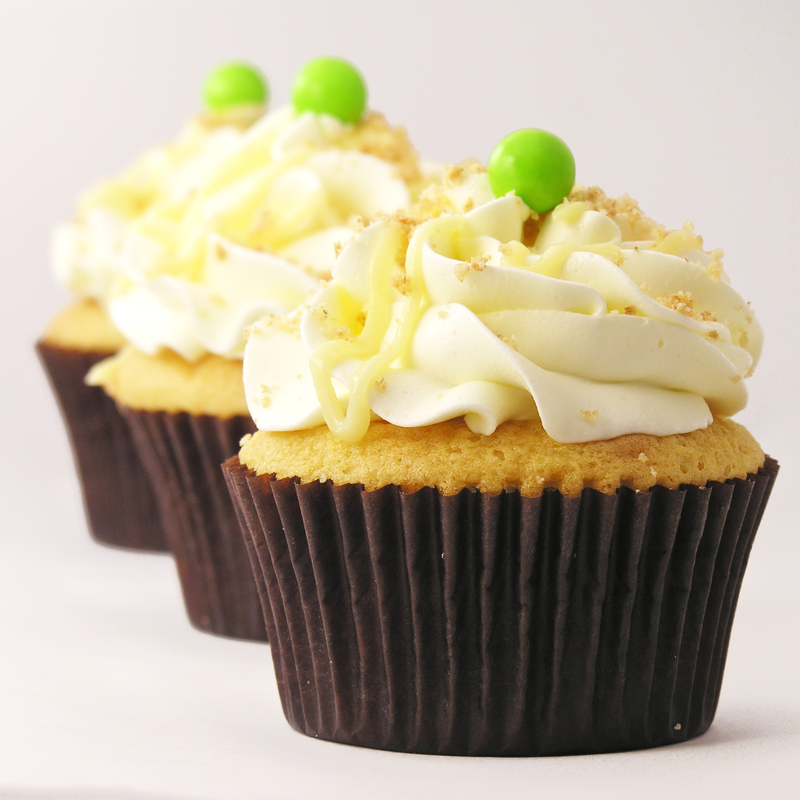 Remove a small bit of this vanilla-free icing to garnish the tops of cupcakes and set aside. Add vanilla/coffee mixture and beat again until well- combined. 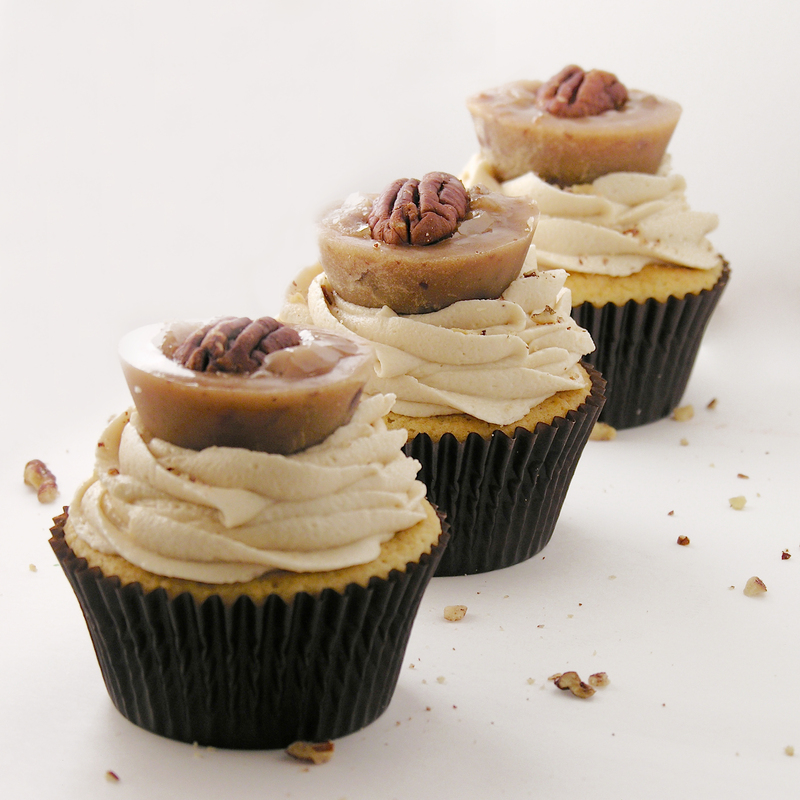 To make plain cupcakes, just pipe coffee frosting on top of cooled mini cupcakes and then pipe a tiny bit of the white frosting at the tip of the cupcake. Sprinkle with cocoa powder if desired. 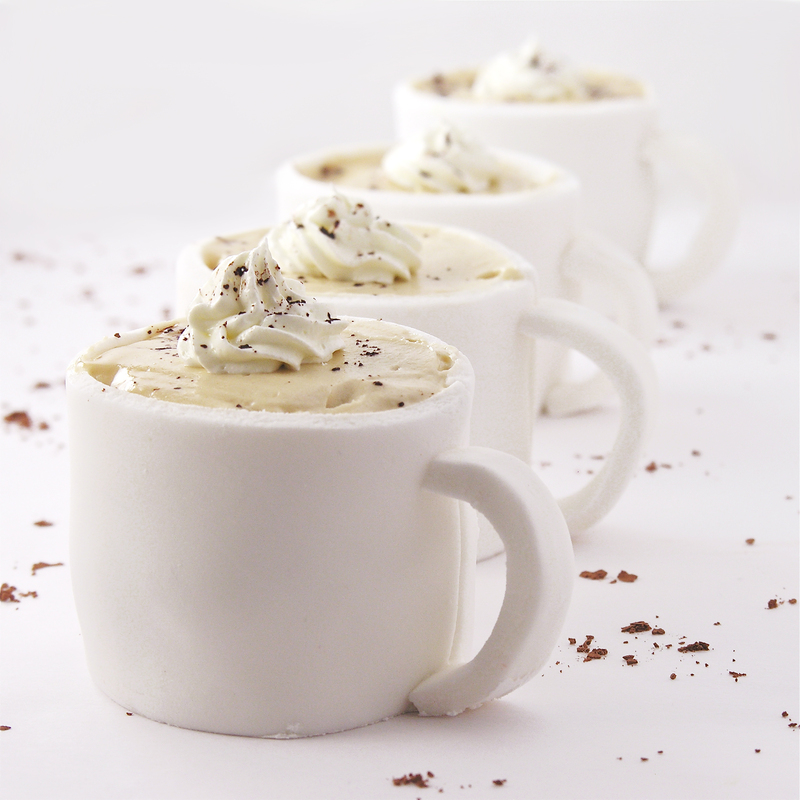 To make the cupcakes into little edible mugs, you will need to make fondant and a thick buttercream ahead of time. My previous post goes into great detail on making fondant and buttercream icing. Click here to see the entire process. 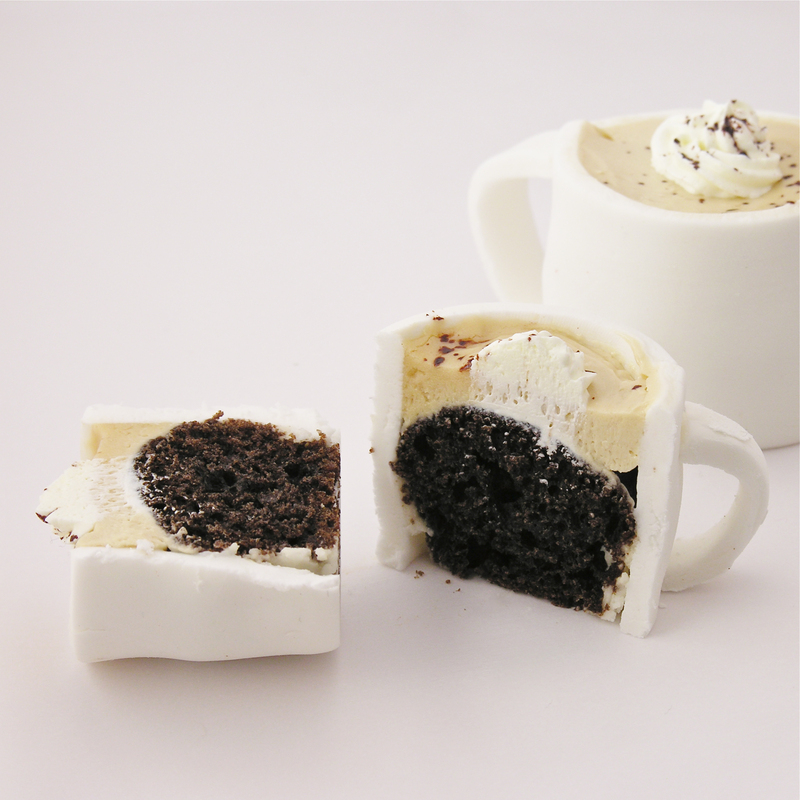 Unwrap the mini cupcakes you wish to use in mugs. 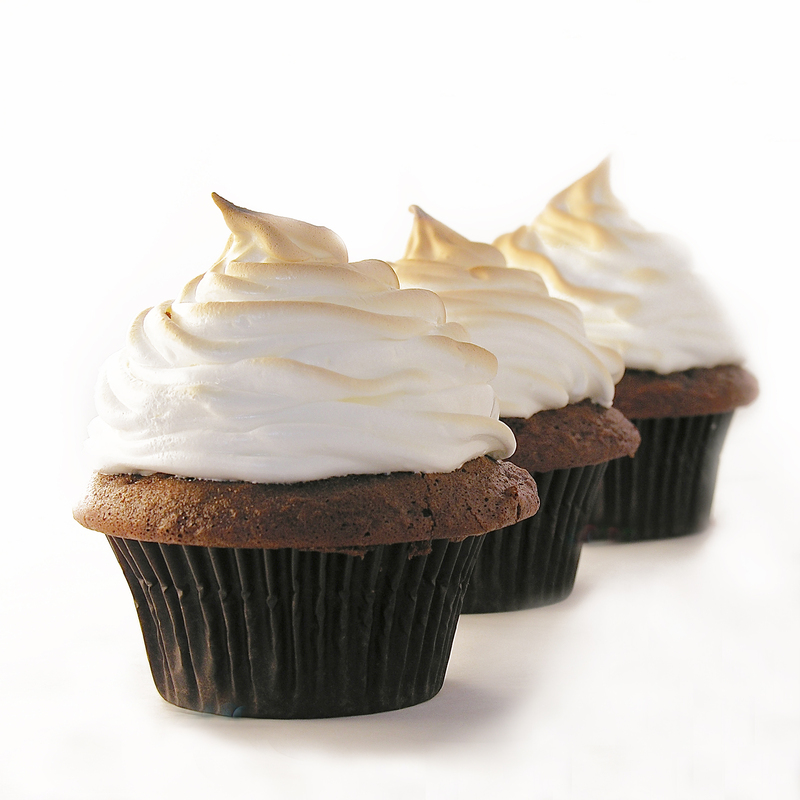 Spread thick buttercream icing around the sides of each cupcake. 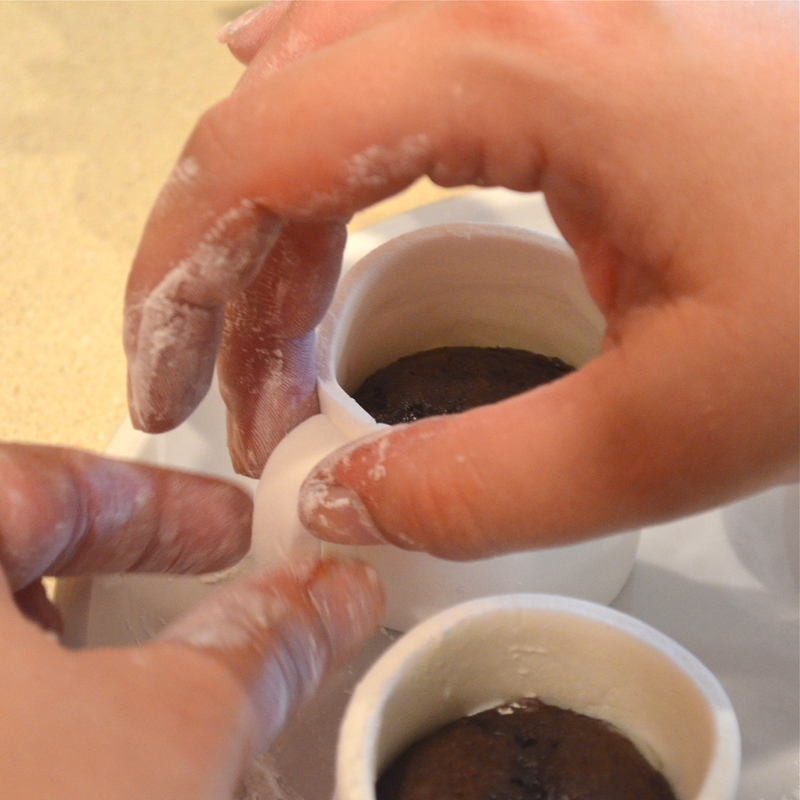 Also cut small strips of fondant to use as mug handles. 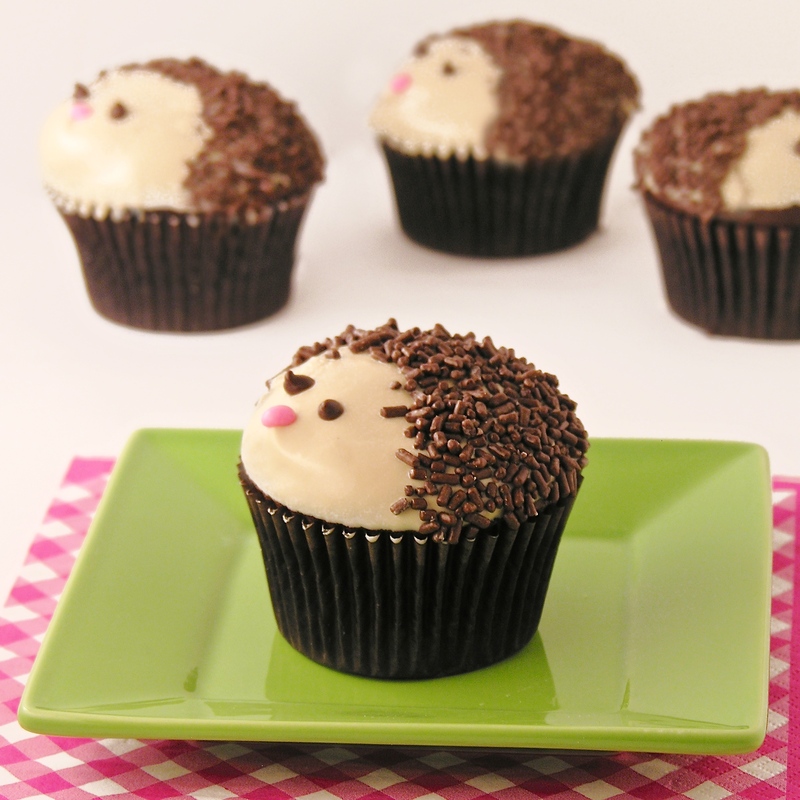 Wrap sides of mug around the frosted edge of each mini cupcake and seal the edges by brushing with a bit of water and holding together. 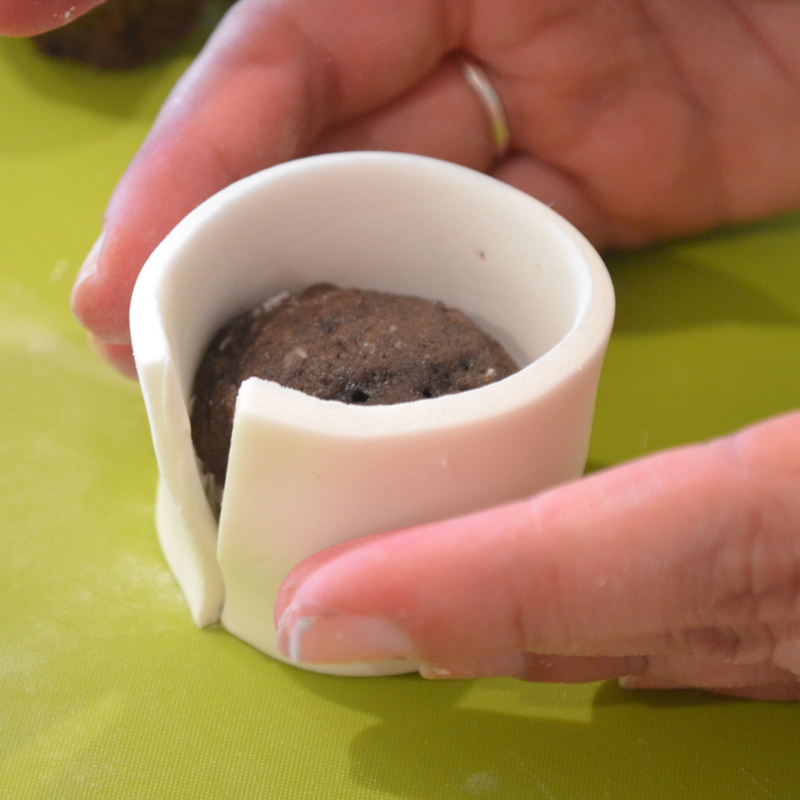 Attach the handle over the sealed edge with a bit of water. Set mugs on a plate or dish with a lipped edge to hold the handle in place until it sets. Once handle is dried in place, pipe mocha frosting on top of cupcake to fill mug in. Spread frosting flat and pipe a tiny bit of the white frosting on top. Megan (more artistic than I!) decorated some mugs to personalize them for us. 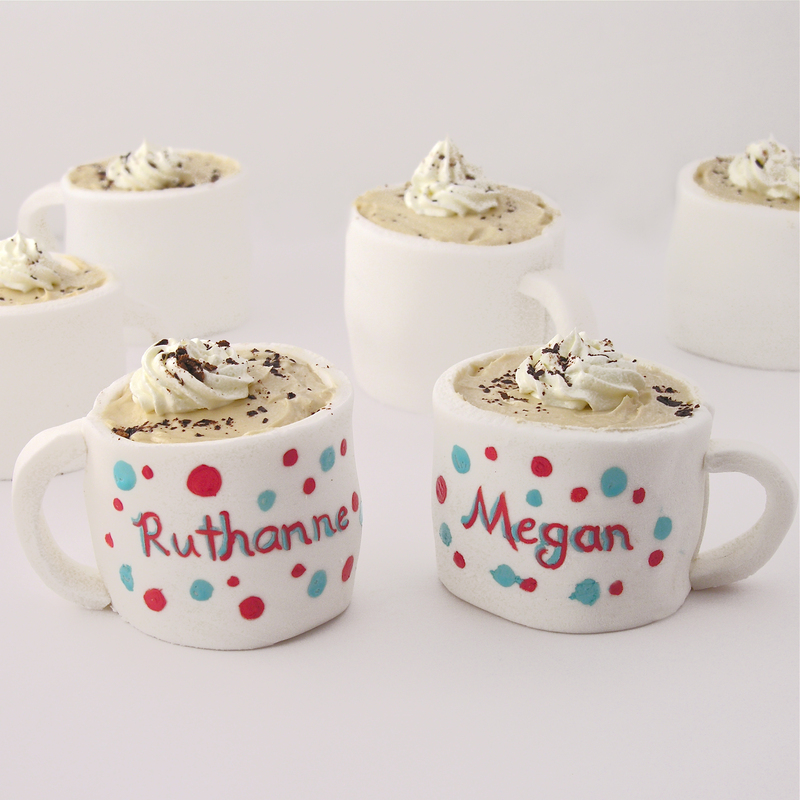 She used decorating brushes with gel food coloring to paint the cups….aren’t they cute???? My thoughts: These are really yummy cupcakes- even without the mugs. The mugs are a little time consuming, but if you want something REALLY unique and fun they are both! 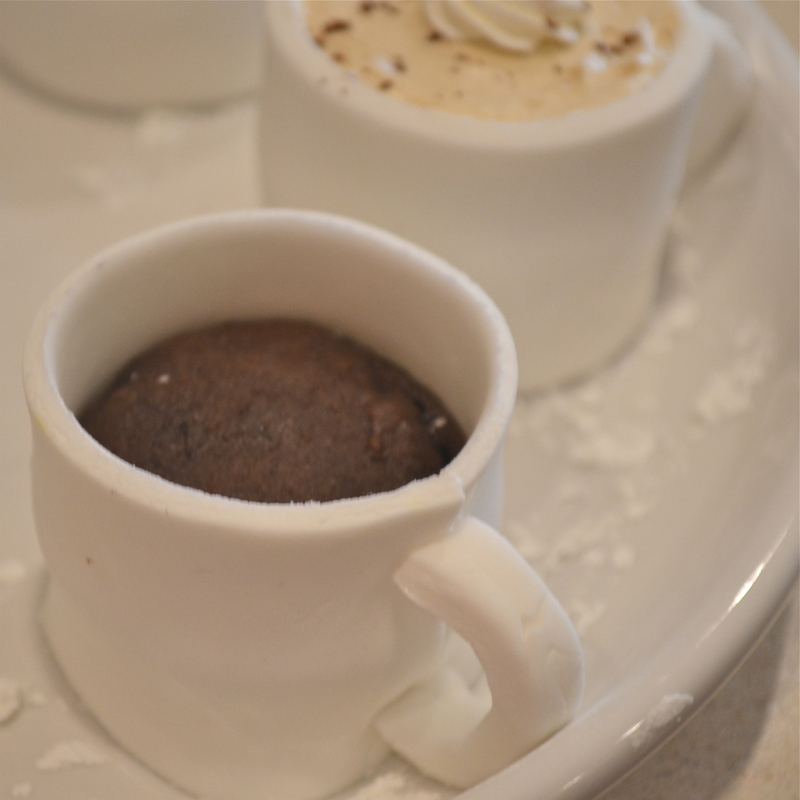 The marshmallow fondant got rave reviews from our friends– they loved it and ate the entire mug with the cupcake. When you bite in, it is quite the surprise….so fun!!!! Enjoy!!! Posted in Cupcakes, Fondant and tagged baking, chocolate, coffee, cupcake in a cup, cupcake in a mug, cupcakes, dessert, dessert photo, edible coffee cups, edible mugs, fondant, fun cupcakes, marshmallow fondant, mocha, mocha buttercream, mocha cupcake, unique cupcakes, unique dessert. Bookmark the permalink. 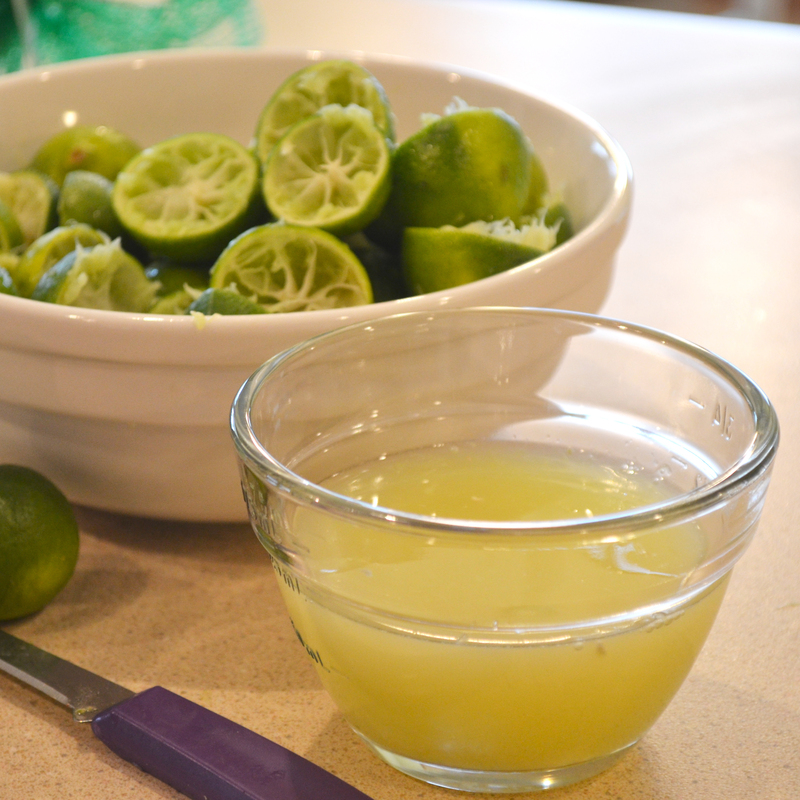 Mix together key lime juice, sweetened condensed milk and egg and pour into a small casserole. Mix crushed graham crackers with melted butter. Make cake mix according to box, and divide batter equally between the 24 cupcake liners. 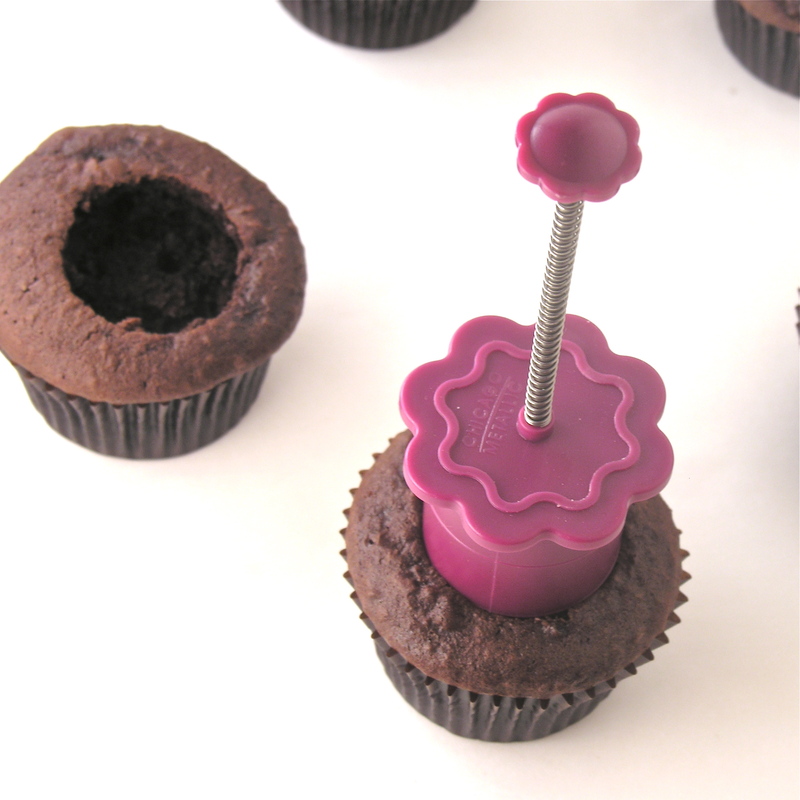 Core cupcakes (I love my Cupcake Plunger – it is so quick to use and saves the core to place back on top of the filling- to see a picture of how it works, click here). Spoon cooled filling into a zip top bag and clip a corner off. 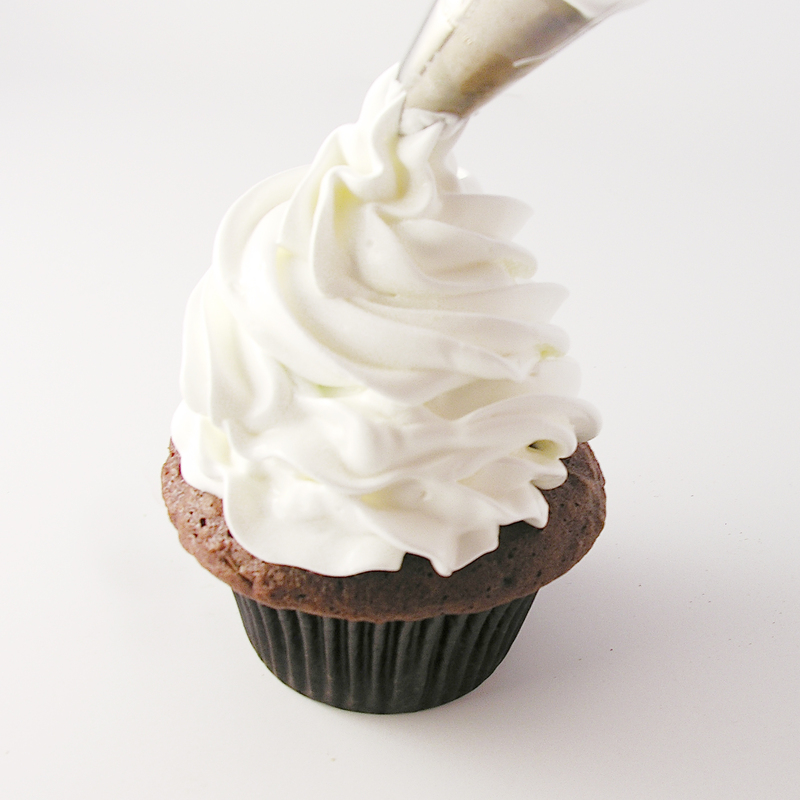 Pipe filling evenly into each cupcake, saving about 1/4 of a cup of filling to drizzle on the top at the end. Place butter, powdered sugar, vanilla and 2 Tablespoons of key lime juice into a large bowl. Using a mixer, beat on high until light and fluffy. Pipe frosting on top of cupcakes and drizzle remaining filling on top. Sprinkle with remaining graham crust crumbs and ENJOY!!!! My thoughts: I created these for a graduation party. 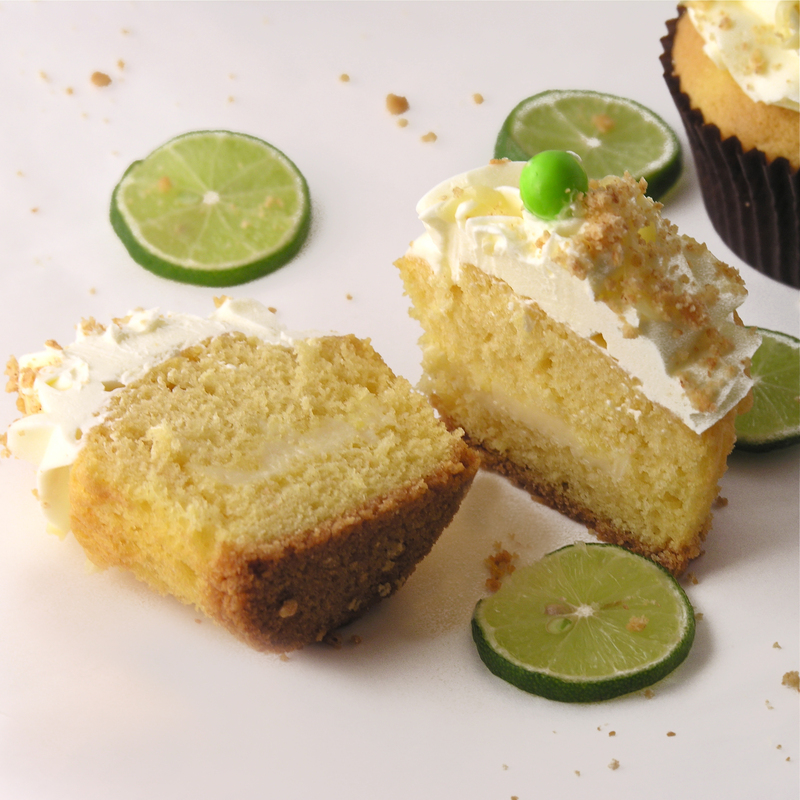 The challenge was to create a key lime cupcake for someone who LOVES key lime pie. Key lime pie is one of my favorite desserts, so it was a fun task. These were a big hit. I love the balance between the tart center and the sweet cupcake and frosting. 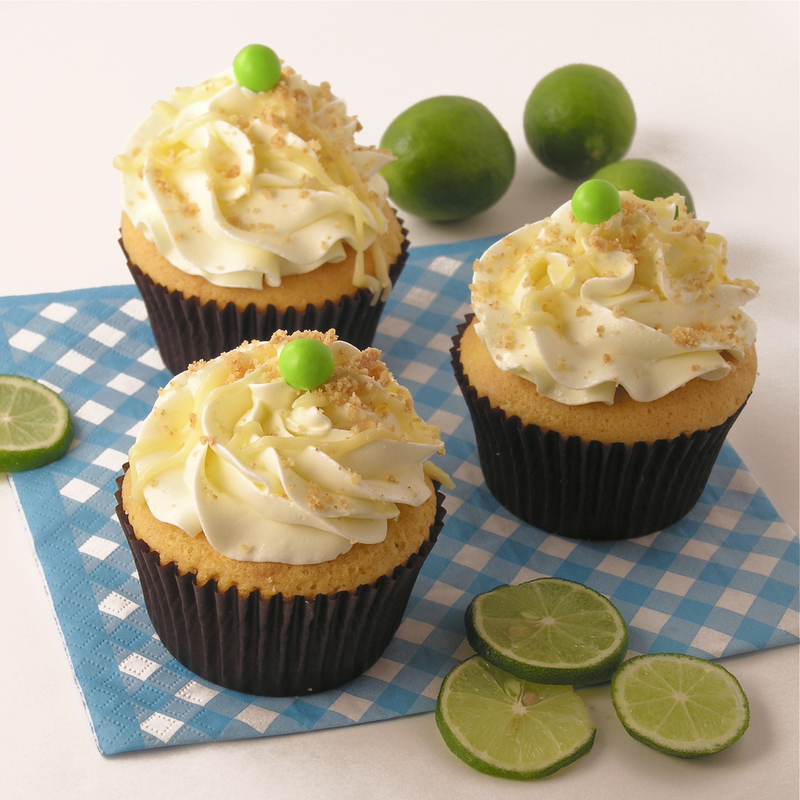 It’s spring~ you NEED a key lime cupcake!!! Posted in Cupcakes and tagged amazing cupcake recipe, baking, buttercream frosting, cupcakes, dessert, filled cupcake recipe, food, fruit dessert, fun dessert, graham cracker crust, key lime buttercream, key lime filling, key lime juice, key lime pie, key lime pie cupcakes, key limes, unique cupcakes, yellow cake mix. Bookmark the permalink.